Hi everyone! 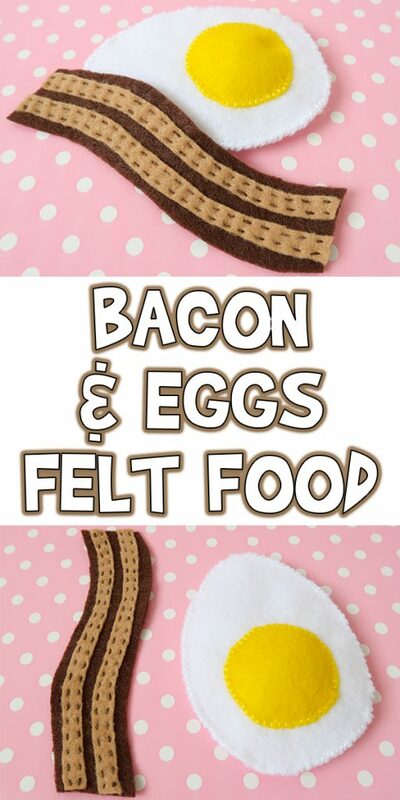 Today I’m back with this Bacon & Eggs Felt Food Tutorial + Pattern for you. 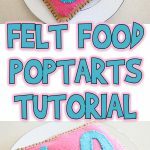 This is a great addition to your felt food collection, and is an easy half hour nap time project. Here’s what you’ll need. 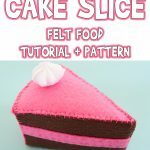 Check out our other felt food sewing patterns, too! 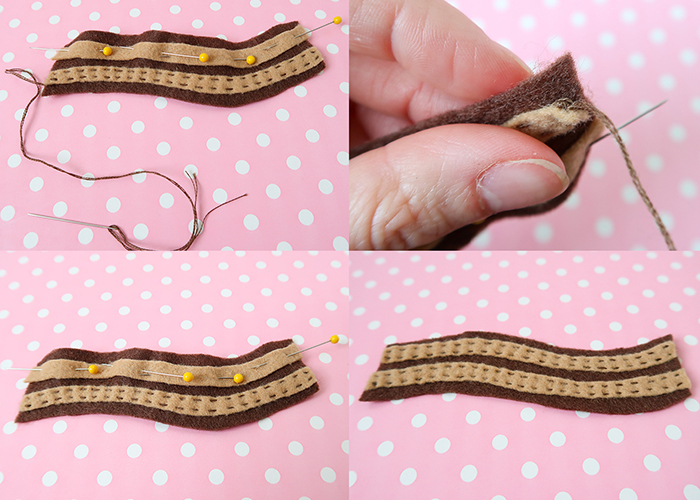 Dark brown, light brown, yellow, and white felt. Yellow, white, and dark brown embroidery thread. 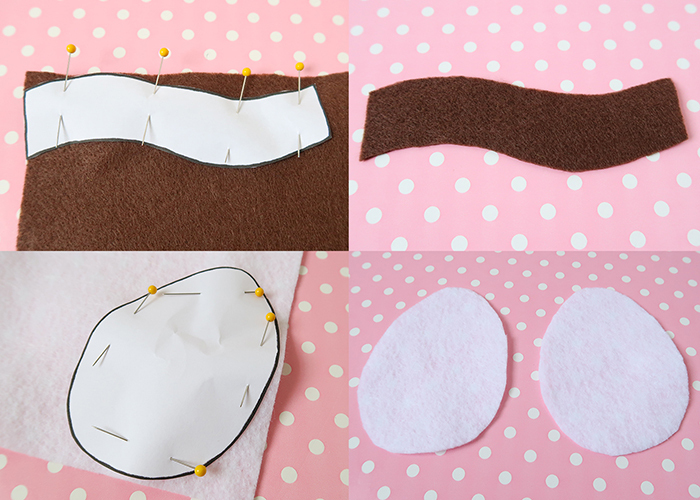 Start by cutting out your pattern pieces. 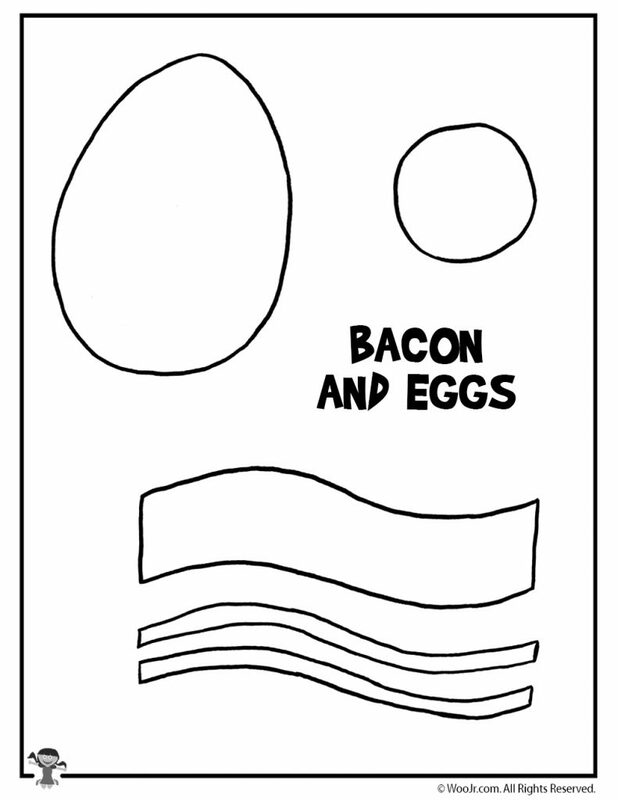 You have the egg white, egg yolk, main bacon piece, and bacon stripe pieces. 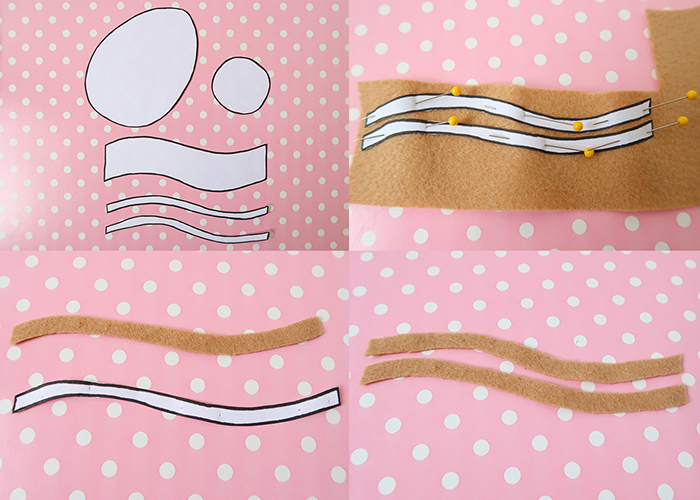 Place your bacon stripe pieces on the light brown felt, pin them in place, and cut them out. 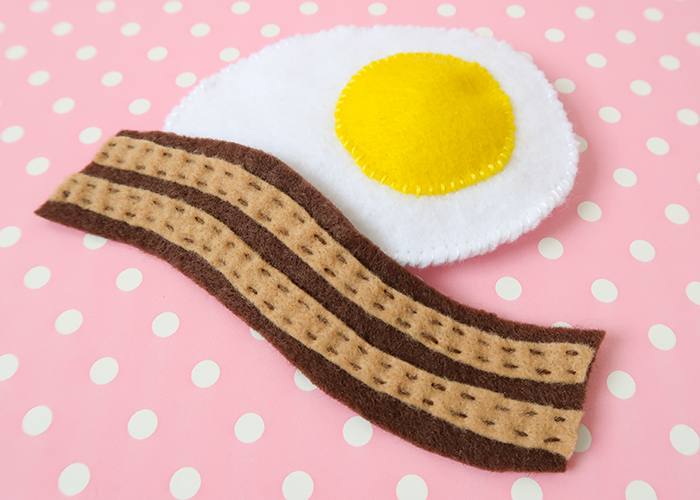 Set your main bacon piece on your dark brown felt, pin it in place, and cut it out. 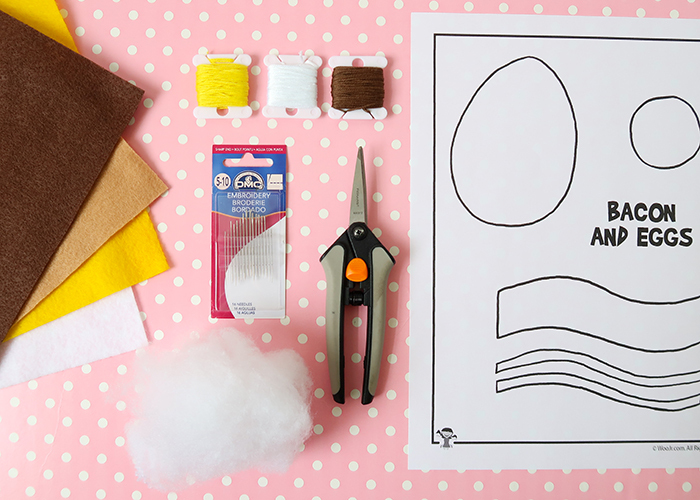 Then put your egg white pattern piece on the white felt, and cut it out. You’ll need two piece of egg white. 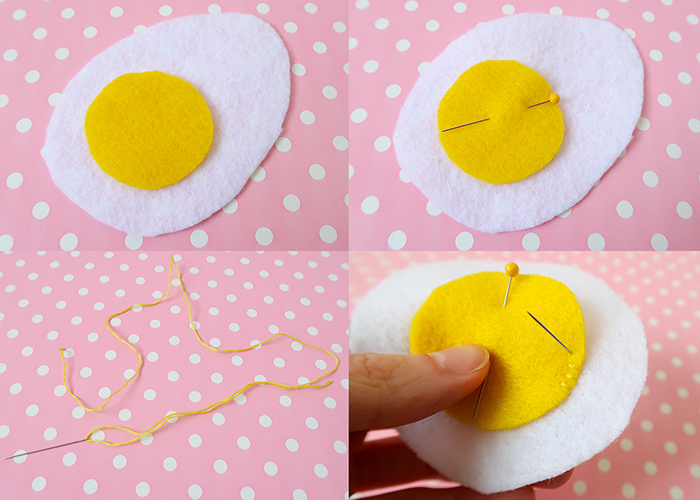 The last piece you have to cut is your egg yolk, which will be from your yellow felt. 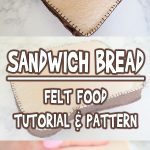 Now let’s get to sewing! Place your bacon stripe pieces on top of the main piece, and pin in place. Cut about 20 inches of embroidery thread, and for this whole project we want to use a thinner amount of thread. Embroidery thread is comprised of 6 strands. Pull the thread apart so it’s split in half, and you have two strands of three threads each. Thread your needle with the 3 strand section, and tie a knot at the end. You’ll do this for every threaded needle we make for this project. And if this seems like it will be annoying, just use the whole embroidery thread. It’s up to you and what look you prefer. 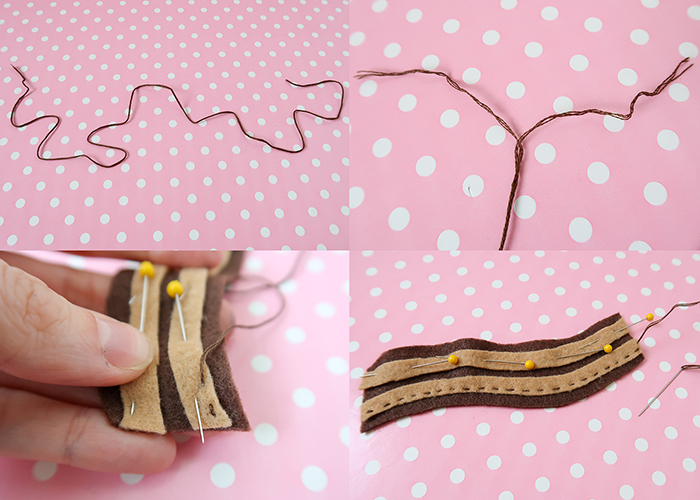 Start stitching your bacon stripe pieces to the main bacon pice with a running stitch. I did a row of stitches on each edge of the stripe piece, and then hid the knot under the stripe. Then I sewed the next stripe on, trying to keep the stitch size the same. Your bacon is done! 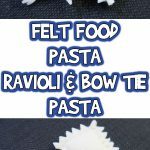 It’s super easy to make. Now let’s make our egg. Place the yolk on top of one egg white piece and pin it in place. 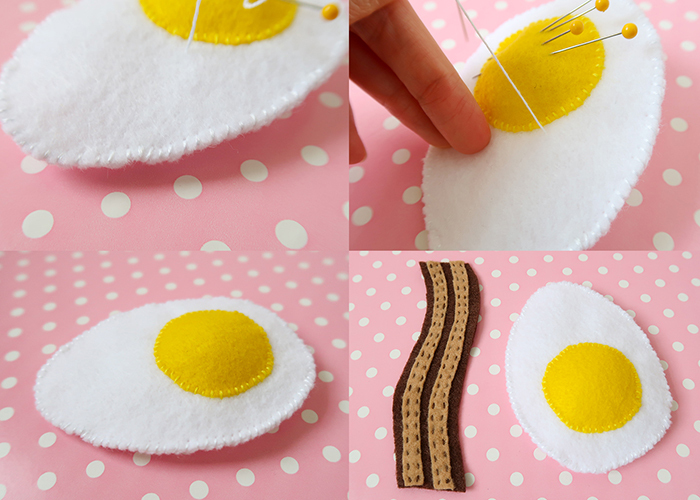 Thread some yellow embroidery thread and start stitching around your yolk. Stitch all the way around, leaving a small opening. Insert a small amount of fiber fill into the yolk. 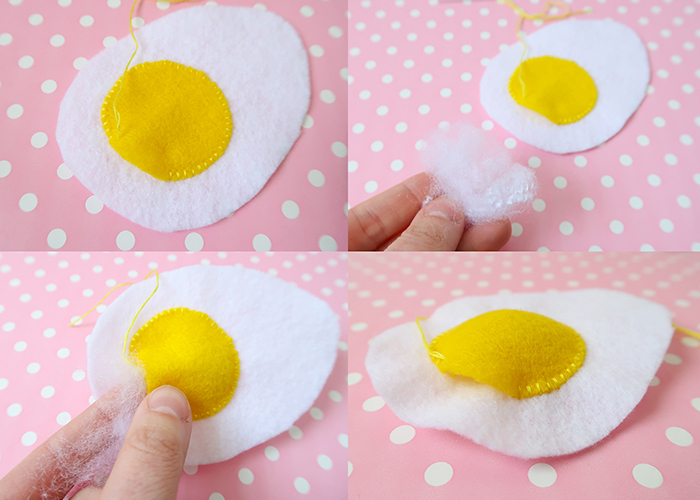 Then stitch the yolk the rest of the way closed. 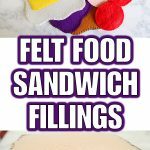 Grab your other egg white piece and a very small amount of fiber fill. 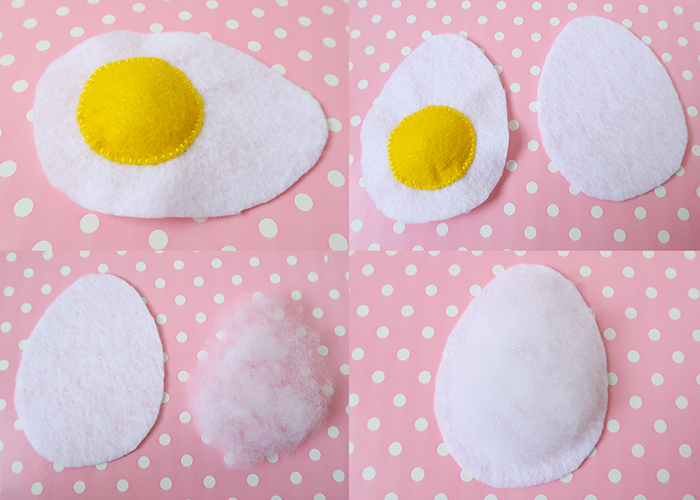 Shape the fiber fill so it’s very flat and slightly smaller than the egg white shape and place it on top like shown. Now layer your main egg white and yolk piece on top, and pin all the way around the edges. Thread some white embroidery thread and stitch all the way around the egg. 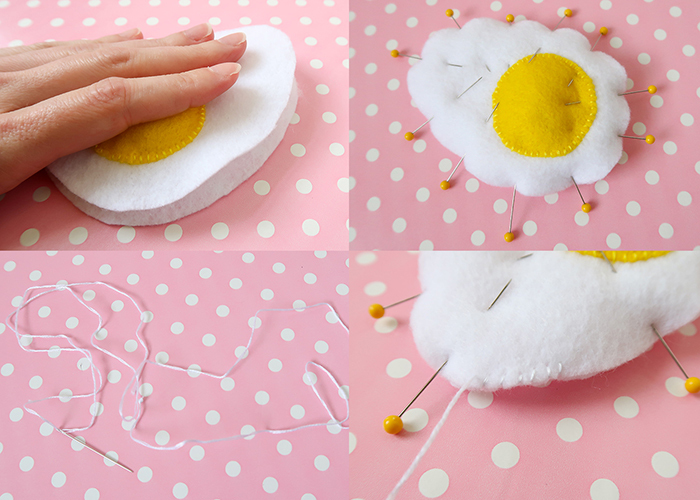 Tie a knot and pull it inside the egg, and cut the thread off so the knot disappears. Now you have a finished egg with a slightly puffy white and yolk. You’re all done! 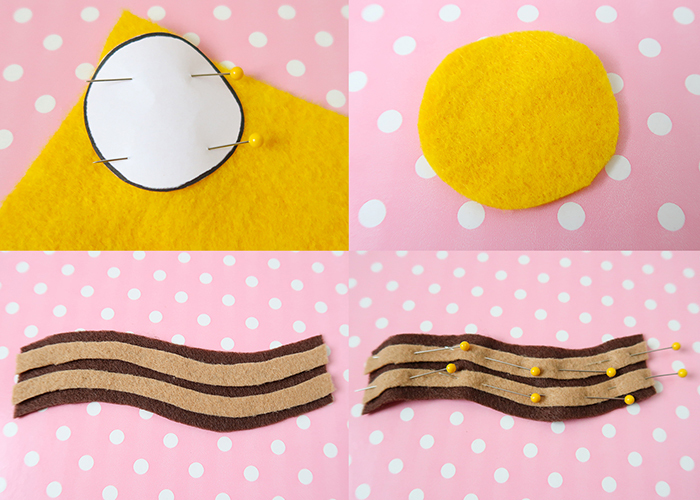 I hope you love this Bacon & Eggs | Felt Food Tutorial + Pattern, and find it helpful! 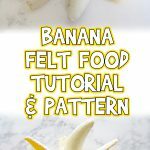 The pattern is below, and all you need to do is click on it to be taken to the page where you can print it out!